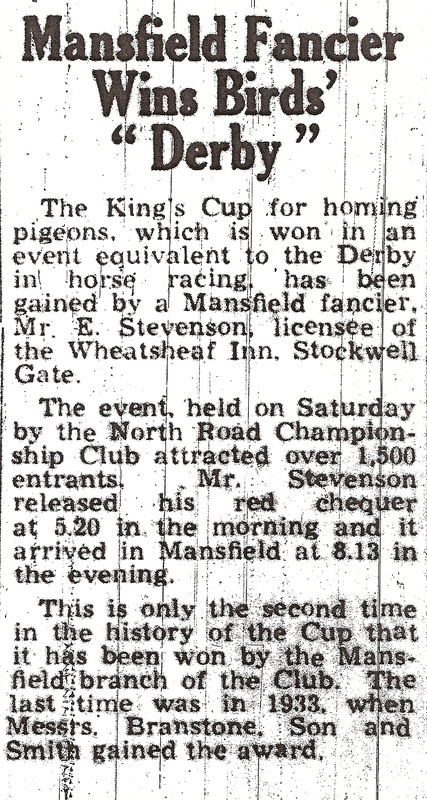 During the last century the sport of pigeon racing in Mansfield was very competitive, there were two main clubs ‘Mansfield Town Flying Club’, who had their headquarters at the ‘Wagon and Coals’ public house on Ratcliffe Gate (building now demolished) the club was later replace by ‘Mansfield Central Flying Club’ in 1955 and its headquarters was at the ‘Brown Cow Inn’ also on Ratcliffe Gate. The club flew races from the South at distances of 60 miles to over 500 miles in France, the secretary Ken Perry was probably the countries longest serving pigeon club secretary having been in that office for over 50 years until he retirement in 2006. The other club ‘Mansfield North Road Flying Club’ flew similar distances up to 480 miles from Lerwick in the Shetland Isles north of Scotland . 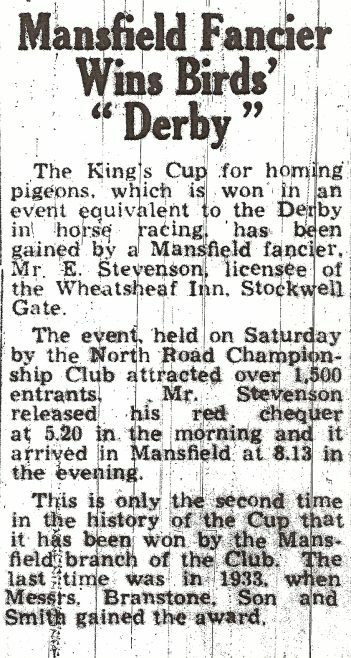 Some members from this particular club took part in the grand national of pigeon racing which was organised by ‘The North Road Championship Club’ the race was from Lerwick and each year men from different parts of the country competed for the prestigious ‘Kings Cup’ this celebrated much sought after prize was famously won four times by Mansfield pigeon fanciers, first in 1933 by Branstone, Son and Smith, secondly by Mr Enoch Stevenson in 1950, again in 1952 by Vic Divit and in 1958 by Arthur Smith. 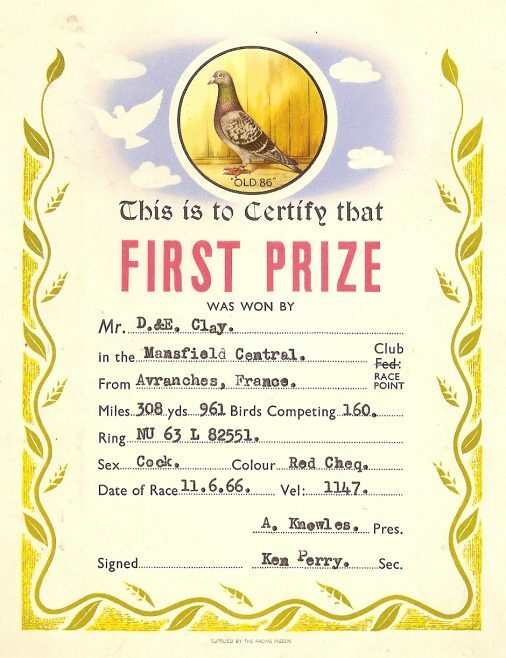 There are still pigeon clubs in Mansfield but no doubt the heyday was in the 1900?? ?s before the advent of television, computers and ownership of motor cars etc which had led to a decline of interest for the sport in the younger generation. 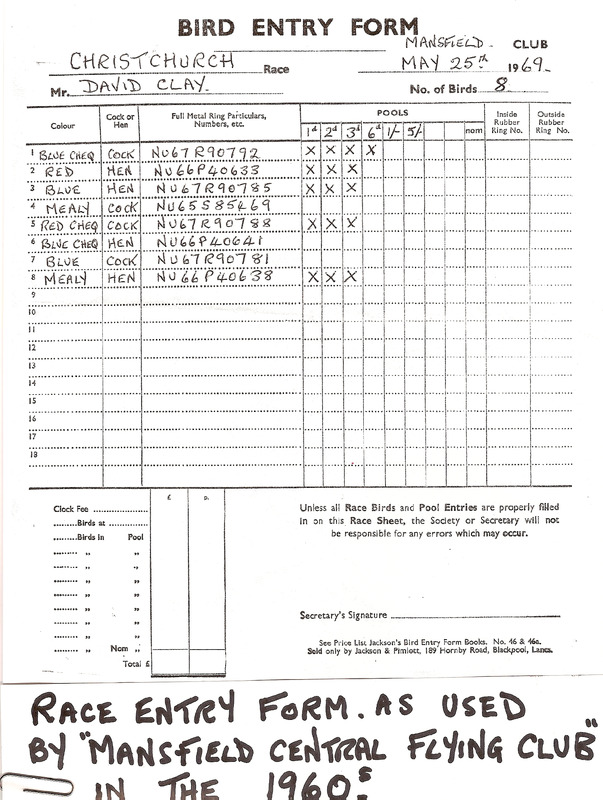 This is a pigeon basket label that I used on August 10 1960 . 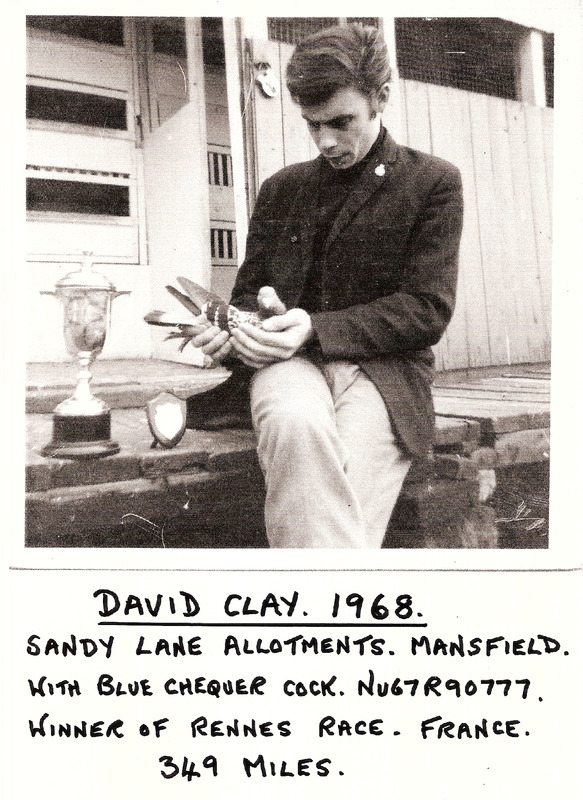 It was fixed to the training basket and sent from Mansfield Railway Station to Loughborough Railway Station, costing 3 shillings and sixpence (17½ pence in today’s money) it was a 30 mile regular training flight. The train porter who released the pigeon wrote the time and weather on them. 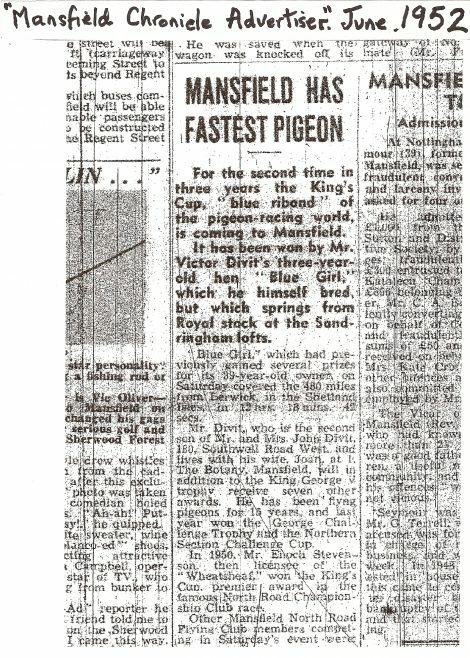 The Racing pigeon would have a metal ring on one leg which identified it to its owner and on the occasion of a race a rubber race ring would be placed on the birds other leg. The numbers on the rings would be recorded by the race committee. When the bird returned home the rubber racer ring would be put in a thimble and inserted into the clocks thimble chamber and striker on the side of the clock was pressed locking the thimble inside and recording the time. 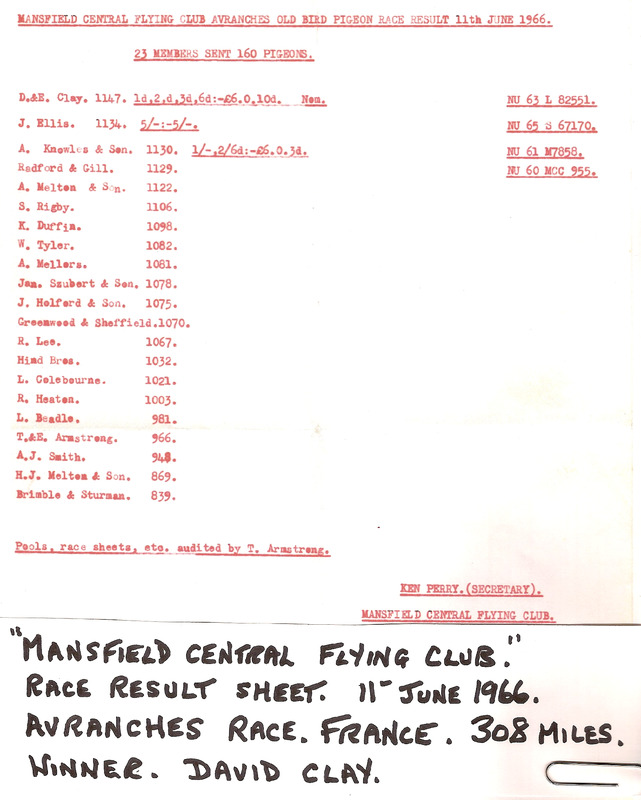 After the race the clocks were opened by the race committee and the numbers on the race rings verified. 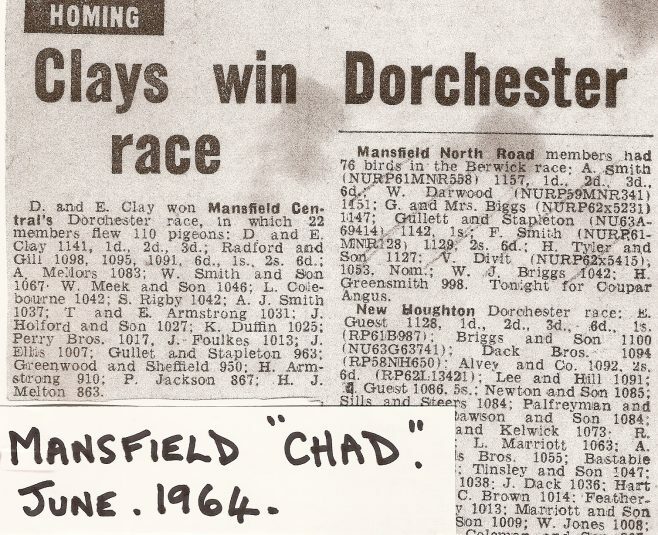 The clock times would be compared to find the winner. 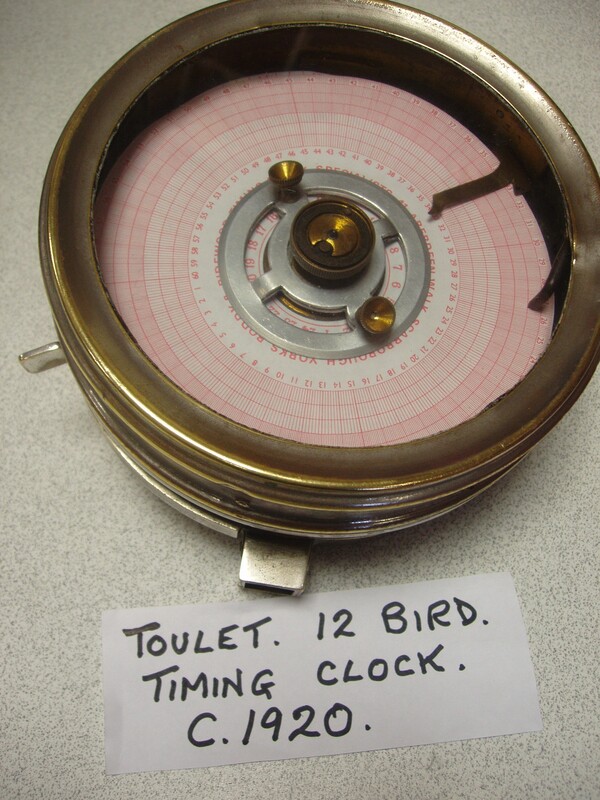 This clock could be used to time in up to 12 birds coming home from a race. 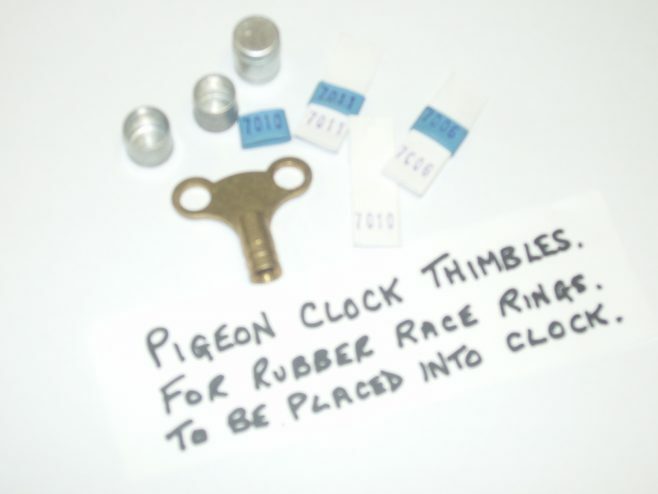 The rubber ring would be taken from the birds’ leg and placed into a thimble which was then inserted into the square chamber on the clock and the striker on the side would be pressed to record the time. This type of clock was used from around 1920 and continued for some 80 years and was a very highly prized possession of the pigeon man until recent years when it was made obsolete by technology. 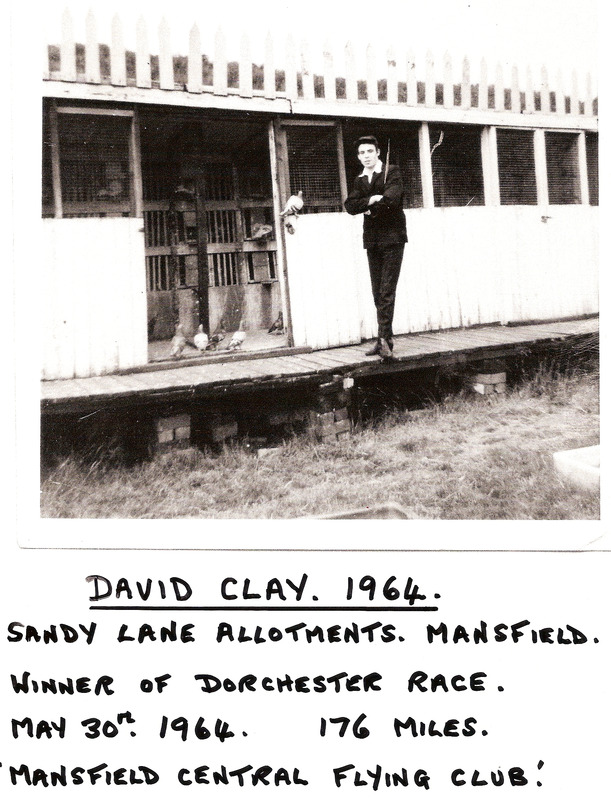 They have now been replaced by quartz digital clocks and electronic scanners.